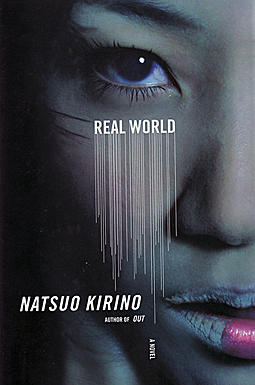 Having already reviewed Rebecca Copeland’s translation of Grotesque, I thought it wouldn’t hurt to go ahead and write an entry for Philip Gabriel’s new translation of Kirino Natsuo’s novel Real World. Real World is not as long or as grand of a story as Grotesque; and, as a result, it is much less intense. I would argue, however, that this is not necessarily a bad thing. Grotesque is extremely graphic and upsetting for hundreds of pages. Real World is about 250 pages shorter, less graphic, and less upsetting. That being said, it is an extraordinarily dark novel, and just as heartbreaking as Out and Grotesque. Fans of fragmented narratives will appreciate the structure of Real World, which is divided into eight different chapters, each narrated by a different character. The characters in question are Worm, an underachieving student at an elite high school who “snaps” and murders his mother, and a group of four high school girls who help him run from the law. Of these five characters, Worm is the least interesting. Yuzan is a lesbian from the wrong side of the tracks who has tried to find love in Tokyo but failed, leaving her disillusioned with life. Kirarin is a perfect princess in school but leads a shady side life of compensated dating in Tokyo. Terauchi is smart kid with a bright future, but she has been deeply scarred by her mother’s extramarital affair. The “main” narrator, who narrates the first and last of the eight chapters, is Ninna Hori. Ninna is perhaps the most normal of the five, but she too is more than a little jaded with the social roles she is expected to fill, and her comments about herself and her friends are full of insight. She is also the only character left to pick up the pieces at the end of the novel. I found Real World to be not only an engrossing read but also a refreshing look into Japanese youth culture, which is so often glimpsed through rose-tinted anime sunglasses in America. Being a high school student is no more glamorous in Japan than it is in America, and Japanese students have just as many problems as America students (and perhaps more). Moreover, Japan is not just a country of cherry blossoms and vermillion torii gates but also of ugly convenience stores and crappy train station cram schools. Kirino’s novel is superlatively anti-romantic. Please don’t let the topic of high school students allow you to think for a moment that Real World is a novel for kids; it doesn’t get much more “adult” than this. Each narrative voice is realistic, mature, and fully-realized, and, even though the subject matter is undeniably gloomy, the quality of Kirino’s writing (and Gabriel’s translation) makes this book and extremely interesting and enjoyable read. If regarded from an ediditor’s point of view, this book isn’t very special. I’d dare to say that it’s flavourless, and maybe useless, spencially if compared to Kirino’s latest books. Literary techniques are really absent, here. What do you think?